On the Main Line: On the photographic treasures of a barely known 80 year old Jewish encyclopedia. On the photographic treasures of a barely known 80 year old Jewish encyclopedia. The Judisches Lexikon, a very good but often overlooked Jewish encylopedia produced in the 1920s Berlin, is now online. Naturally it's in German which means it isn't accessible to everyone, but it includes many fantastic pictures and it's really worth looking through them for the pictures alone. Unfortunately the sources for these pictures aren't given, but I assume that it is an authentic image. 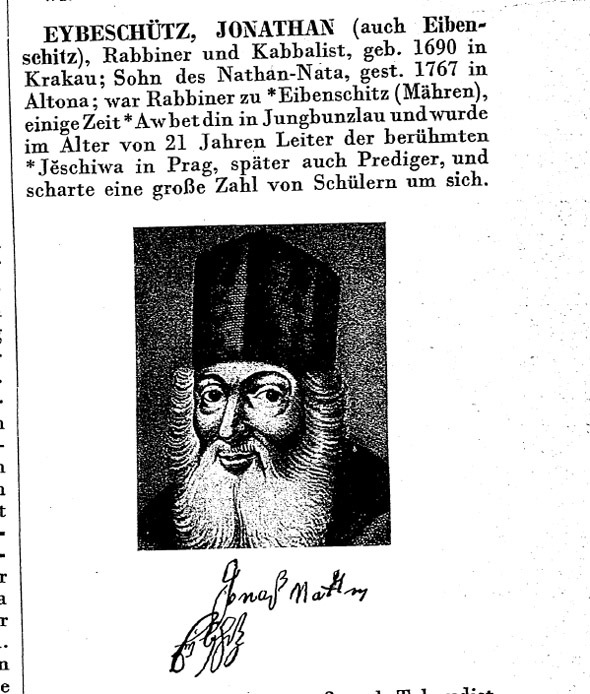 So if you ever wondered what a Central European yeshiva bochur looked like in the 18th century, now you know. Yes, that gargoyle is a Christian, Jew, and a Muslim (per the caption). The point is that the Frankists are creating a monster-hybrid, with no legs to stand on. Here's a picture of Herz Homberg. I have a vague idea that I've seen a portrait of him before, but not this one. I have to say, he looked just like you'd think he would. This is just from the standard portrait of R. Yonasan Eybeschutz, but it has his signature in the Latin alphabet. 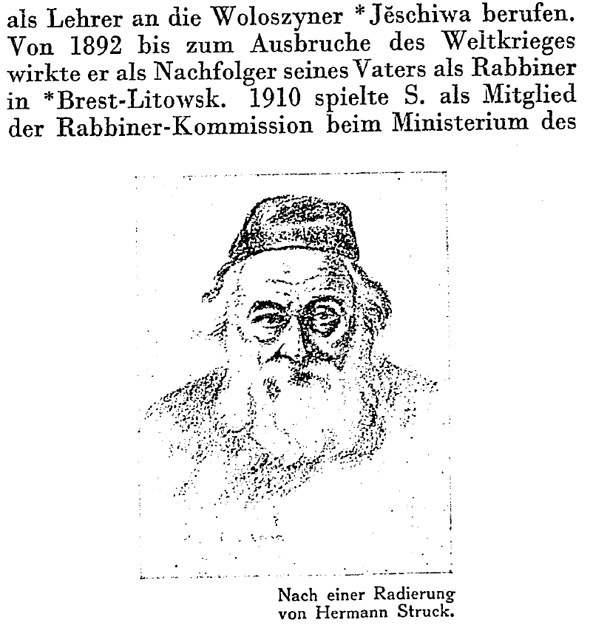 This is Rabbi Jacob Joseph Oettinger, the last traditional rabbi of Berlin. As I posted here, he is really the one who claimed that while Zunz knows with what sort of tobacco Rashi indulged, but he knows what Rashi said and taught. This notable quip is regularly misattributed to Rabbi Jacob Ettlinger, a far more famous rabbi with a similar name. 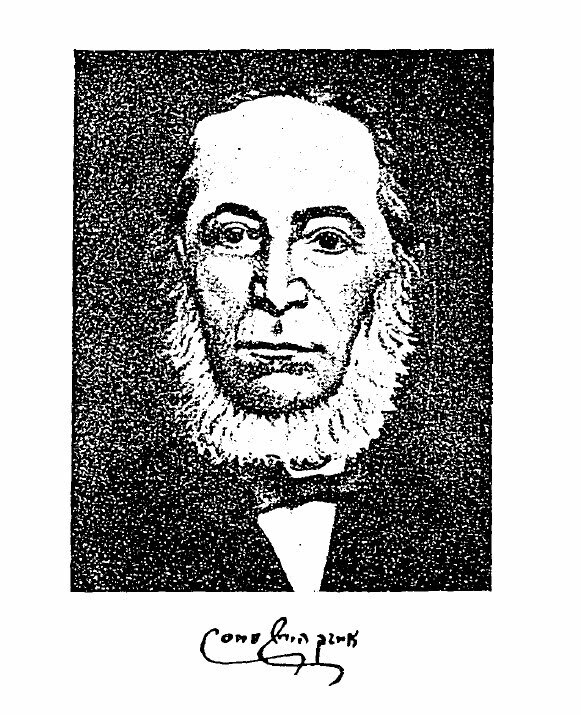 Here's a portrait of Isaac Hirsch Weiss, which differs from the more commonly seen one. 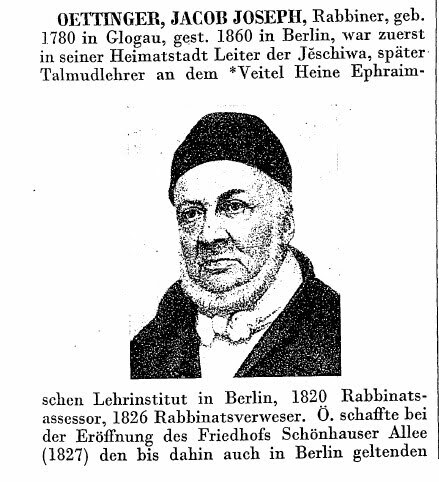 Here's R. Chajim Soloweitschik, drawn by the master judaica sketcher of the time, Hermann Struck. There are, needless to say, many beautiful pictures of objects and places, but since the scan quality isn't so great I'm not going to show them. At the end of each volume is two or three pages listing all the images and their page number. One of the things I always like to look for in any work of this sort is how aware and how comprehensive are they in covering people and things outside their comfort zone. Thus, in an Orthodox oriented almanac or encyclopedia the thing to look for is how it covers contemporary non-Orthodox Jews and things, and in a non-Orthodox publication like this one the thing to look for is how aware it is of contemporary Orthodoxy. In this case, it's almost a double task because of the issue of how German Jews related to Eastern European Jewry (although admittedly the situation was worse before WWI). This is one reason why the first Encylopedia Judaica gets high marks and the newer second edition gets very low marks. The first EJ knew and cared all about who was who in Orthodoxy. The second edition doesn't seem to have heard of the major 21st century players. Naturally it has entries on the Chasam Sofer, R. Akiva Eger and the Vilna Gaon, but of course it would. I was more interested in contemporary coverage (in this case, late 1920s). 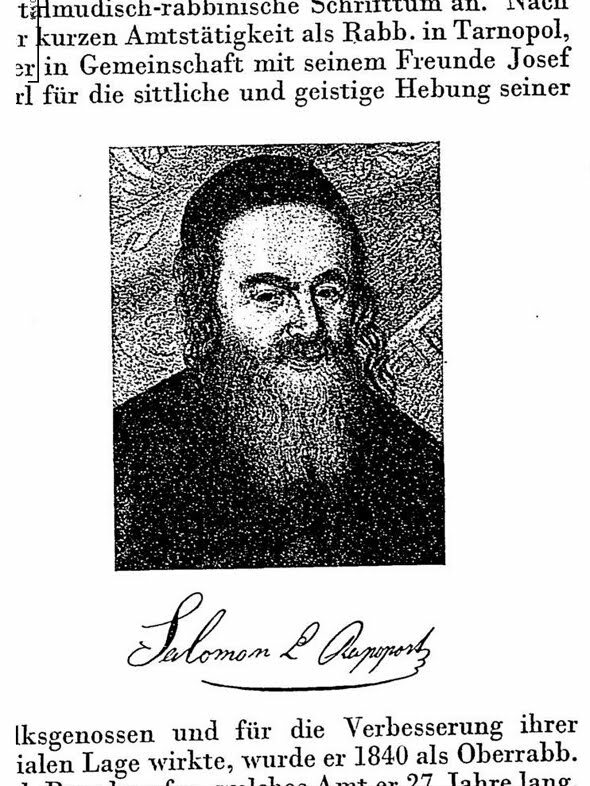 I looked in vain to see if the Chafetz Chaim is in the Judisches Lexikon, but it has entries on R. Moshe Mordechai Epstein, R. Kook, R. Jechiel Weinberg, R. Yitzchak Elchanan, R. Bernard Revel, R. Yissachar Dov Ber Rokeach of Belz (includes a picture), many German Orthodox rabbis, and, as you can see from above, an entry on R. Chaim Soloveitchik (and his father). It also has entries on davening ("dawnen") and mitzva tanz, and many other small details about Jewish life and culture and, most importantly, bibliographies in each entry. The importance of a pre-war encyclopedia like this one is also that, sadly, there is almost no doubt that many of the pictures are of objects that are forever lost. 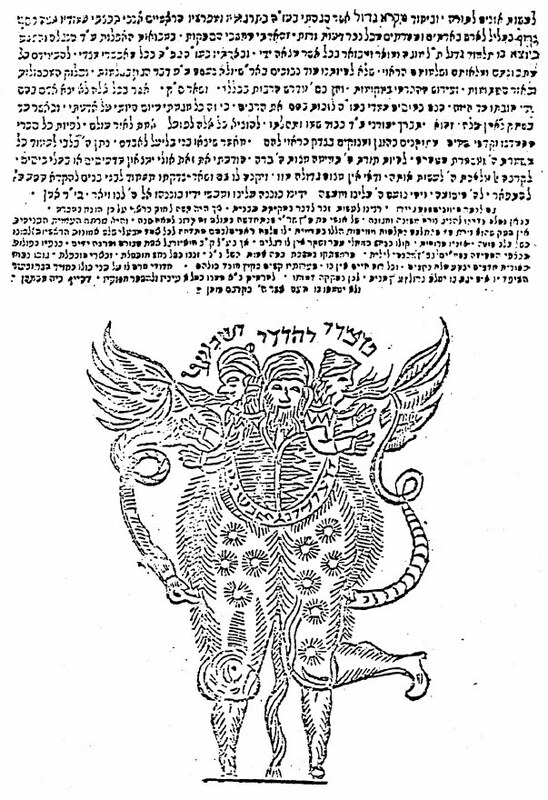 While the Judisches Lexikon was not as comprehensive or detailed as the original German Encylopedia Judaica, which was published during the same period, the EJ only went up to Lyra. The other advantage is that quite simply the prominence of people, things and places changes over time. There are doubtlessly entries which merited a certain amount of attention in the late 1920s which would scarcely be mentioned at all today. So you have little choice but to consult an older work such as this one; that applies to the Jewish Encyclopedia of 1906 as well and, indeed, to all older reference works. 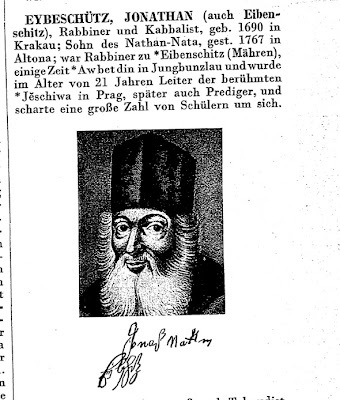 "So if you ever wondered what a Central European yeshiva bochur looked like in the 18th century, now you know." > This is just from the standard portrait of R. Yonasan Eybeschutz, but it has his signature in the Latin alphabet. Very cute. But of course he wrote extensively, if not exclusively, in Hebrew. "This is one reason why the first Ency-C-lopedia Judaica gets high marks and the newer second edition gets very low marks. The first EJ knew and cared all about who was who in Orthodoxy. The second edition doesn't seem to have heard of the major 21st century players." "The second edition doesn't seem to have heard of the major 21st century players." 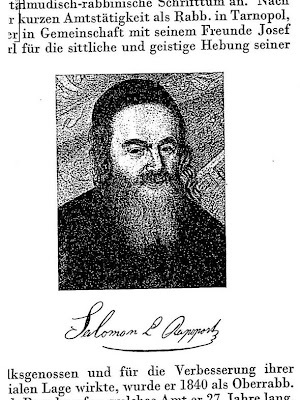 "For example, in volume 5 (S - Z) pg.756 there is the following, captioned "Prager jüdischer Student im 18. 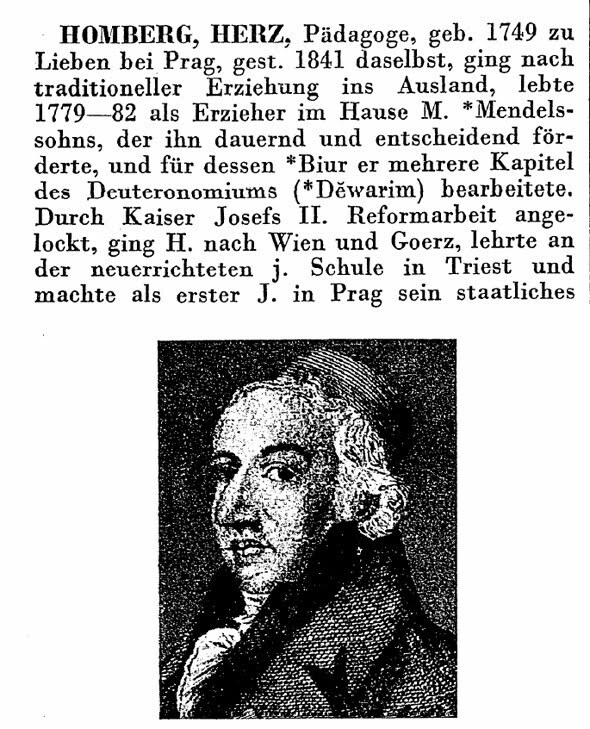 Jahrhundert" (Jewish student of Prague in the 18th century):"
My recollection from the thesis of R. Katz of Baltimore on the early Rabbinic career of R. Y. Landau ab"d Prague, was that the Yeshiva bochurim there then wore tricorns (three cornered hats, think George Washington and Hamantashen) of different types. So I am puzzled by this illustration. Nevertheless, thanks for another great post. There's a simple (possible) solution. 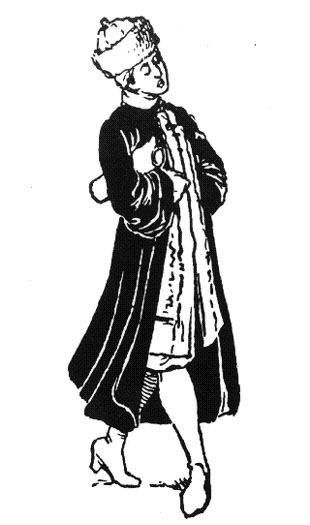 This is an early 18th century image. Although the tricorne was popular in Europe throughout the 18th century, it should not be surprising if it only made it to traditional Jewish society some time into the century. Here I posted about how in the early 19th century Prague wearing the tricorne was regarded as old-fashioned Jewish, while wearing the zylinder (top hat) was modern. We see that by century's end even many traditionalists wore the zylinder. Perhaps something similar is going on here. Or, maybe the evidence just speaks for itself. Solomon Schechter's Genizah gossip from 1898.